Osteoarthritis (OA) of the ankle has several causes, such as fractures around the ankle and chronic ligament injuries. Abnormal ankle morphology, such as varus deformity of the articular surface of the distal tibia, also causes ankle OA. Treatment must take the cause into consideration, as well as the stage of ankle OA, especially in varus-type OA. Conservative therapies consist of lifestyle guidance, pharmacotherapy, intra-articular steroid and/or hyaluronic acid injections, exercise therapy, physical therapy, orthotic therapy, and shoe inserts. Training of the peroneal muscle is particularly important in OA following injury to the lateral ligament. Standing on the toes so that the head of the first metatarsal presses against the ground can strengthen the peroneal muscle. As for surgeries, arthroscopic debridement, distraction arthroplasty, lateral ligament reconstruction, and distal tibiofibular ligament reconstruction, corrective osteotomies are selected as joint-preserving procedures. Low tibial osteotomy is indicated with stage II or IIIa OA and distal tibial oblique osteotomy is indicated in stage IIIb cases. 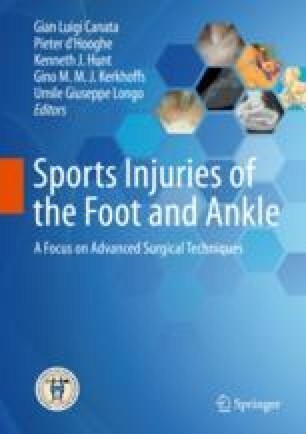 Ankle arthrodesis or total ankle arthroplasty is indicated in stage IIIb or IV cases. Arthroscopic arthrodesis is possible if ankle varus or valgus is no greater than 15°. Nowadays, if the talus in the patients is severely destroyed, total ankle arthroplasty using a total talar prosthesis (combined TAA) can be selected.